I recently got an Eachine QX70 (https://www.ebay.com/p/?iid=371843981009&lpid=82&&&ul_noapp=true&chn=ps) and it was really fun, but I was unimpressed with its build quality. I have covered the thing in hot glue trying to fix it. I really want a tiny whoop that could withstand my flying, but was still small and under 100$, or at least under 120$ and had a flysky RX. I was looking into buying a gremlin, but they are a little expensive and i didn't see any frames with blade guards, which is a must-have for me, as I may crash into family members or cabinets. Any feedback appreciated! The FT Gremlins were just released today. Sounds like the Gremlin might be a little much for indoors according to Josh Bixler and Alex Zvada. Perhaps look at something like the Eachine E010S FlySky 65mm Micro FPV Racer. I second the e010 that TazRC recommended. I have one (not the version with camera) and it is a great indoor quad. I bought the "universal module" from banggood, installed in my Turnigy 9x transmitter and it really makes flying it fun (although I can't find it on BG's website at the moment). Only drawback is, I added an fpv cam/vid tx to it and it really can't carry the weight. I'll upgrade the motors someday, perhaps. I just duplicated this build with slower motors for around $138. I bought a more expensive frame than necessary. 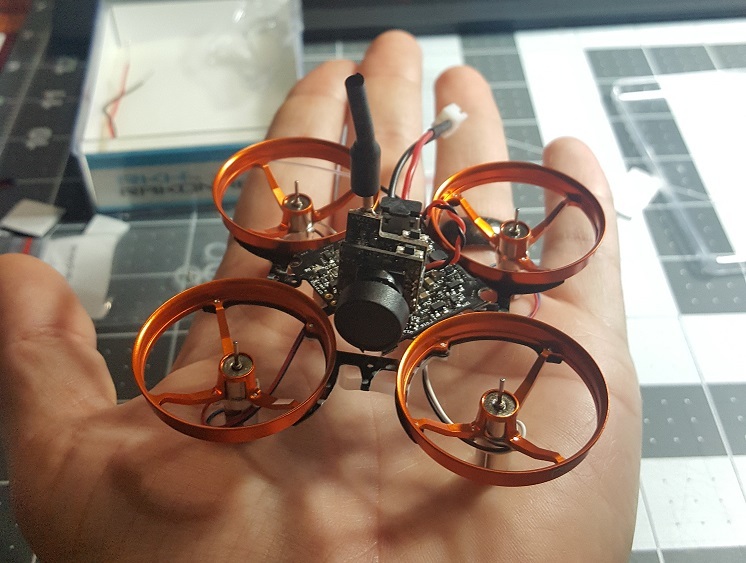 You can do this build with an Inductrix frame or the equivalent Eachine knockoff frame. Also ordered a Gremlin... because I am weak and quads are fun to build and fly. Have you seen the Emax Babyhawk? Thanks guys! I think i'll build something like mwnugget suggested. Yup, has the same issue that the gremlin has. Not a very good indoor flyer. I've flown one in my (small basement) and it is controllable, but it's really difficult to to anything fun with it because it has too much power for such a small space. Got it finished. Flys well. Perfect indoor micro for me. Got build details, flight video?? Thanks. I don't have any video, the Fatshark teleporters don't allow for that. But it flys well. Once the frame is screwed together using the smallest screws in existence, I just double sided taped the FC and camera to finish it all. After that is was a matter of flashing and programming in betaflight. The only thorn I came across was the yaw axis needed inverted in the CLI. I found that procedure doing a Google search. I'd like to mount the FC with nylon hardware eventually, but for now I am pleased. Will the camera you used for the still photo do video? That would be fine. Looks like a nice build, nwnugget. Let us know what kind of flight times you get with that setup. Alright, so I have some video. Really not great. Never realized how difficult it is to fly in frame. Oh, and it weighs 27 grams with battery.